A general round up, thought piece and laying out key developments happening this month. 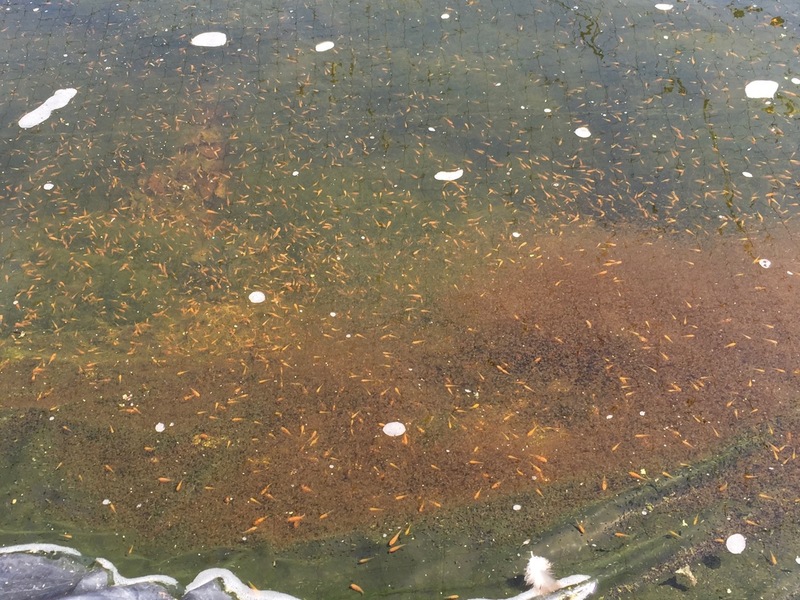 As things stand – we have Sharkey hatchlings growing on in both outdoor fry ponds. This is the largest potential harvest by a long way, of babies from one of our key females. The cooler weather we’ve experienced locally so far this month has limited the fry growth and I’d expect it will take until the end of week 5 at least before they are harvestable size.. possibly the end of week 6. In calendar terms, that’s either the last weekend in June, or the first weekend in July. Around this time of year, I start to get worried about the amount of work coming up. And, it's keeping me up at night! So, I've done two things tonight to help me get to sleep; I've dumped my whole brain load down on paper ... here. And, I’ve laid out a schedule so we know roughly what’s happening in which weeks. The final timing will vary depending on weather, and other husbandry related aspects. But, what’s really important for me is to check ahead and plan for mid summer spawnings. And, with the short summer’s we have here in the UK – every warm week counts. The main news is that – with harvest of early summer spawnings likely at the end of june, early july. 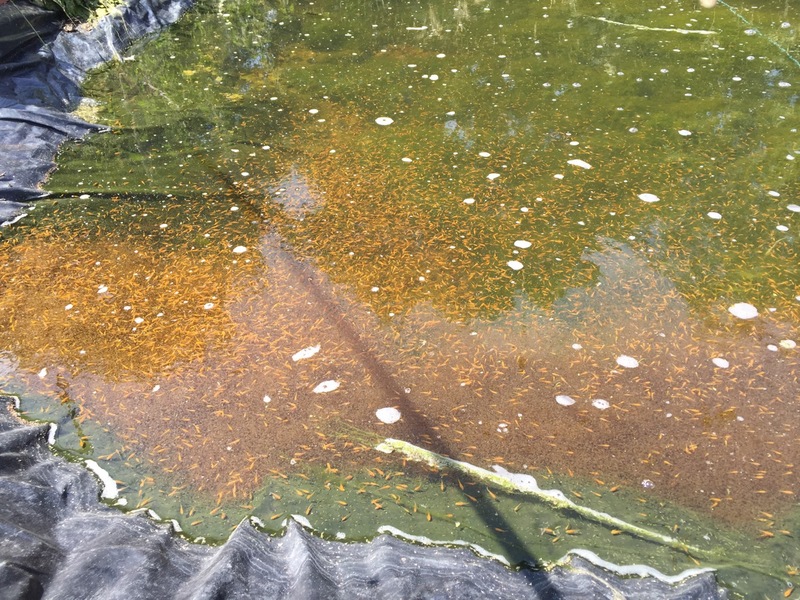 During the month of July, in addition to that harvest and selection work, we will also need to empty and prepare the ponds for the next use. Spawn at least 3 females, and prepare hatchlings for putting outside. And then – all being well… put them outside. Sometimes, knowing what you have coming is worse than actually getting stuck in when it arrives. And, that’s basically how I’m feeling right now. Waiting for the storm. The other thing on my mind right now, is .. not only how we make late summer spawnings happen.. but, also how we make best use of them too. I reflect on last year, where I had the fry ponds ticking along like a Ferrari on a race track. And then we harvested the pond and we simply didn’t have the recirculation growing on pond space to be able to make proper use of them. This year, if we get the late summer spawnings right again.. I want to be in a better position and to be able to make full use of every fry we harvest. So we're also going to need to build more tosai rearing tanks. And, that takes me nicely on to the tank building work we are currently undertaking. In the next few weeks, we are replacing our growing on tanks for new railway sleeper built rectangular tanks. This will basically replace what we currently have, but in a smaller footprint. And, there will be a small increase in the overall usable growing on space too. By optimising out polytunnel space in this way, it clears enough space for us to build a second tosai growing on system. And this will roughly double the tosai growing on space we currently have. So – track back to me wanting to make best use of the late summer spawning; I have it in mind that we’ll need this second set of tosai growing on tanks to really make use of the late spawnings. Also, thinking ahead to future years.. when we have more fry ponds outside…. We should be in a position where we will be rearing around double the number of tosai. And by tripping our fry pond space, and doubling the tosai rearing space - we should also be able to improve quality of our tosai and older fish too. The other issue I’m grappling with at the moment , is the lack of showa hatchlings. And having used up both our Showa females in reaching this point. Our customers are telling us they’re looking forward to seeing some Byer Showa… along side our Kohaku. And, we are a bit stuck in that regard. To have another go with those females, I need them to be eating a lot! And, on the plus side, they got over the spawnings as quickly as I could have hoped. But, in the females tank over the last week we had an issue with the drum – which meant I had to bypass the mechanical filtering drum screens to keep the tank operating. Bio filtration was in full operation. But without mechanical filtration, I’ve withheld feeding completely – essential to maintain pond system balance in that pond situation, but the exact opposite I required to aim these Showa females at late summer spawnings. The simple fact is I have a set amount of time available for the koi farm – and added to the time Amanda puts in – there is more to do that the amount of input time we can provide. And we are in constant prioritisation mode at the moment, and that will continue for most of the summer. During the week last week, we prioritised time to rearing the hatchlings we have. 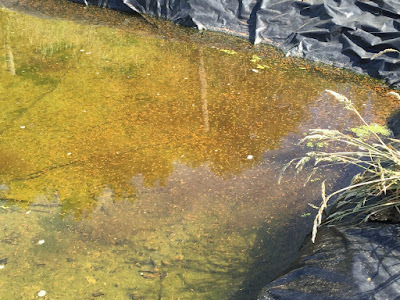 many hours spent clearing algae from the top fry pond and also looking after the few showa hatchlings that we currently have in cage nets. So, it wasn't until last weekend that I was able to prioritise time to repairing the filter , and cleaning out all the accumulated fish waste… And, I have the whole system operating again now perfectly. Feeding has also started again. For late summer Showa spawnings, I would much prefer to use my Showa females for the second time this year. But, another opportunity may be that I use one of my kohaku females with showa males. That would generate showa hatchlings… but, my showa males remain un verified in the spawning stakes. It’s a risky play; I’d like to have verified their performance earlier in the year. But., we are where we are, and at least it’s an option. Further reflections having dumped all this down on paper; if we can carry through the successful early summer Sharkey hatchlings to first selection… then, we’d like to have at least one pond full of showa hatchlings later in the year. So, we will try for that at the same time balancing the risk of using up tried and tested Kohaku females with untested Showa males… when we know the female spawns well with our kohaku males. That decision will be taken in July. Right now, we are focussing on the hatchlings we have and making the most of those. I’ve not even talked about the efforts to rear hatchlings indoors yet. You may remember from previous blog posts that this was a key aspect for us to increase production this year. And, the short answer is that we’ve been maxed out elsewhere. We have two large tanks full of water, and I’ve been trying out various water preparation approaches. Those tests are still in progress– and I’m also behind in setting up the filtration I want in place on one of those ponds. Basically, those two ponds are in limbo. I have a few thousand showa hatchlings, and around 5k sharkey hatchlings left over which I’m holding and intending to use in one of those indoor ponds. Just need the time to get the filtration and autofeeders set up. The next two weeks might give us a window to make some headway in this area.